Rotorua Pubs serving up hearty meals along with full-bodied ales and lots of friendly banter. This would make a visiting Irishman's heart fair quiver with joy don't you think? Luckily our Rotorua pubs are not confined to Irishmen. No, they're for everybody. French, Italian, Australian, English, American… wherever you're from you're welcome. The Pig & Whistle used to be the local police station, way, way back… which I have personal experience of… not in the clanging of the cell door behind me way though. I tried to follow my mother into town at about 3yrs of age and ended up having to picked up from the station. It must be karma because my daughter ended up in the current police station at about the same age. Show her any bit of space and she was gone. Strewth, poor parents when kids get it into their heads to do a runner!!! 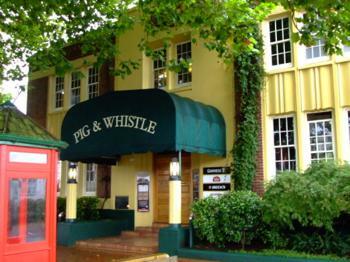 Getting back to the Pig & Whistle, the lovely old 1940's building is loaded with character. Old time police paraphernalia dot the walls along with the big screen TVs that feature all the big sporting events. At night it often goes off with a live band playing Thursday, Friday and Saturday. The place gets packed to the rafters with lots of raucous patrons thoroughly enjoying themselves. Security guards are stationed outside to ensure anything out of place gets handled, plus to monitor crowd size. The Pig & Whistle serves meals throughout the day. You can order curly fries that look just like the curly tails of a pig and the Lamb Burgers (I feel mean saying that I eat them) are to die for, yum… all for $20. The indoor area is quite dinky but there is also a covered outdoor area that is more spacious. They have gas heaters for when it gets cold… and it can. If you are looking for a quiet meal go earlier in the evening before any music starts. Hours: 11.30-10pm for food every day and longer for the entertainment. Hennessy's is another Rotorua Pub institution when it comes to eating and drinking places. Owned and operated by Reg Hennessy who is a bit of a Rotorua icon, it seems like Hennessy's has been around forever. 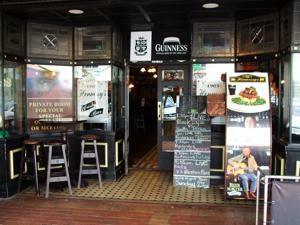 You would swear you were in Ireland once you step through the doorway, the setup is that good. Dark wood, cosy, intimate… that's the overall feel to me. My family and I have found this to be one of the best places to eat in Rotorua if you are looking for a typical pub meal. Pub meals always makes me think of filling stews and casseroles, sausages with lots of mashed potatoes and gravy, mmm. Well, they have that and more. The Hennyssey's Menu is wide-ranging and caters to all tastes. You've got to try their Seafood Chowder. Ha, I've forgotten to mention the beer, or should I say ale? Guinness… they've got it. Looking for a range of Irish beers… they've got that too. In fact they've got all sorts of NZ beers, Irish Whiskeys and wines etc. There's also mention of Kilkenny… I don't know if that's a beer or what. If you're an Irishman it'll mean something to you. Hennessy's have been accredited with the Lion Nathan Beer Masters Award for Quality Beers & Cellar Management.… every year since they opened in 2002. That says volumes about the beer and the handling of it doesn't it? There's a whole raft of things to be covered off to be in the running for this award so I say well done Mr Hennessy. If you're into Irish music? Every Thursday night there is a live band and sometimes on the weekends as well. There's a quiz night on Sundays and if you're into sports they have the big screens showing either live coverage or replays of important games. As if that's not enough, Hennessy's Backpackers are right next door and up the stairs. Staying there also gets you discounts in the bar and the Mad Dogs Sports Bar. Very cool huh, you've got your bed, food and beer all on one site. What more could the discerning traveller want? Hours: 11am till late. Every day! This Rotorua pub would be of interest to anybody who has an interest in craft beers. Brew is a relatively new pub in town that is an extension of The Croucher Brewing Company which kicked off in 2005. Paul Croucher and Nigel Gregory, as the owners of these businesses are quickly gaining a reputation. 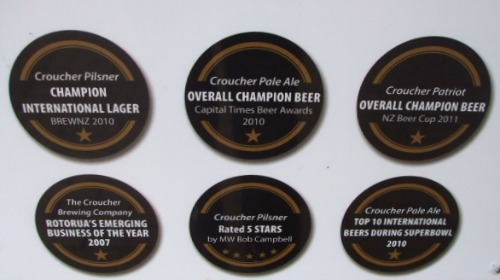 They have won numerous awards for their beers that go by the names of Croucher Pilsner, Croucher Patriot, Croucher Pale Ale and the low alcohol Croucher Lowrider IPA. I was intrigued as I hadn't had any experience of craft beers so decided, along with a few friends and family members, to go along and see what this place was all about. Brew is about NZ craft beers so for NZ$18 you can get four different beers to try in 250ml glasses (I think that was the size). We did it like a wine tasting and these beers were definitely different. Very strong tasting with lots of flavour. We could taste fruit and other things we couldn't quite put a finger on. When you're used to drinking beer in a fashion for most of your life, as in mainstream beer, it could take some getting used to craft beers. Like most things you may have to try a few times to fully acquire the taste. A random thought; that's me, I kept on trying pickled onions until I finally got the taste for them. Along with showcasing their own beer, Brew serves beers from various top craft brewery's from around the country. They also feature New Zealand wines that are hand-selected so that is something else to try. The food at Brew is very tasty and most of the menu incorporates the beers. The Pilsner Fish & Chips are delicious as was the Pilsner Marinated Pork with Plum Sauce. There are platters, pizzas, a children's menu and sweets as well. There should be something to please everyone when the hunger pangs strike. I'm not much of a drinker but it seems that now I have to get around our pubs so that I know what I'm writing about. Hope I don't turn into an alcoholic. As I get to the others (slowly) I will add them. Check back periodically to see what's happening. In the meantime, make sure to check out the google map for directions. If none of these Rotorua pubs appeal you can dig a bit deeper on Menu Mania. It is our most popular search engine for dining out with all sorts of search filters and also reviews by diners. Has the page answered all your questions? Can I improve it? If so, don't be shy to drop me a line. Use my Contact Me page.